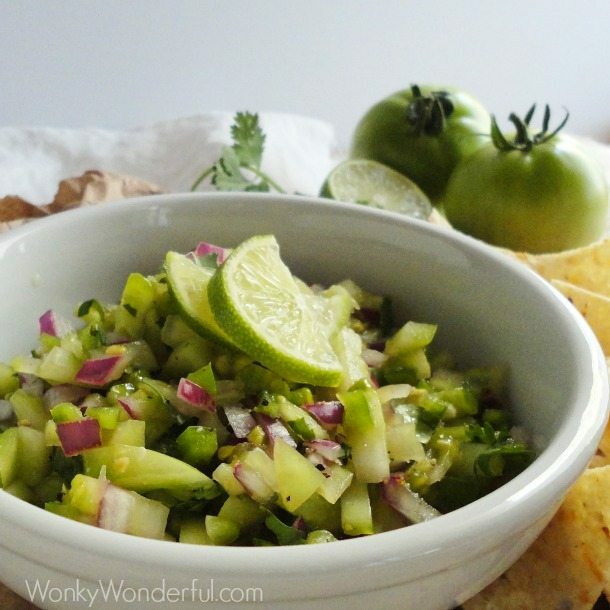 Green Tomato Salsa Verde is bright, flavorful and made with fresh ingredients! A blend of lime, onion, cilantro, jalapeno, garlic, spices and tangy green tomatoes . . . the perfect end of summer snack! While flipping through one of my food magazines I came upon a Ball Canning Recipe pull-out. In it I discovered a new version of Salsa Verde, this one made with green tomatoes. I’ve always made My Verde Sauce with tomatillos so I was curious to see how a green tomato salsa would taste. Luckily friends have been giving me tons of green tomatoes this year to play around with. I was surprised at how similar the flavor of green tomato salsa is compared to regular tomatillo salsa verde. They are both delicious so I guess it just comes down to personal preference. The tomatillo salsa usually requires cooking while my version of the green tomato salsa verde is not cooked. 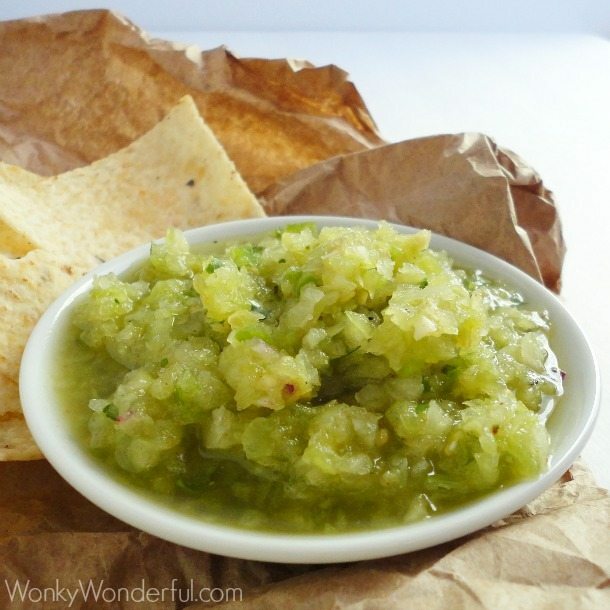 The green tomato salsa verde can easily be made chunky or more restaurant style. 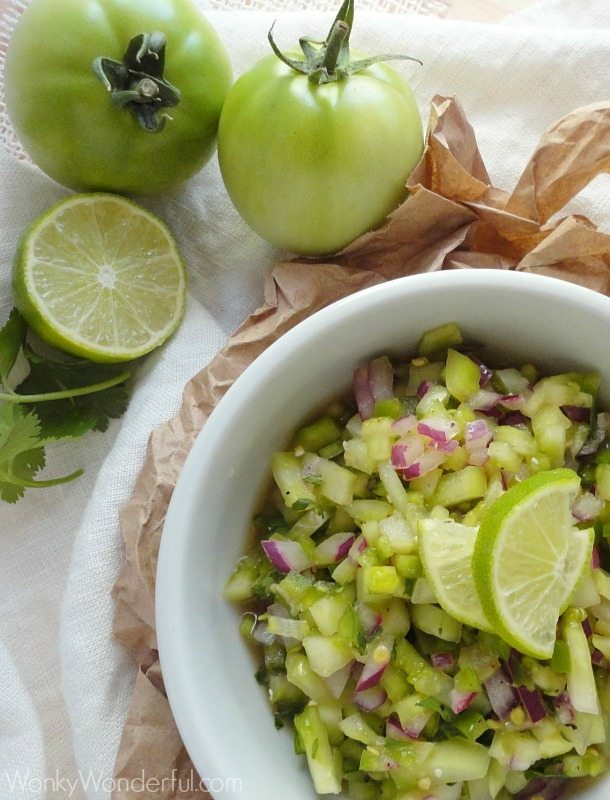 Green Tomato Salsa Verde is also very healthy. It is made simply with fresh ingredients and a few dried spices. Which is perfect for my attempt to eat healthier . . . of course the tortilla chips certainly cannot be categorized as healthy. 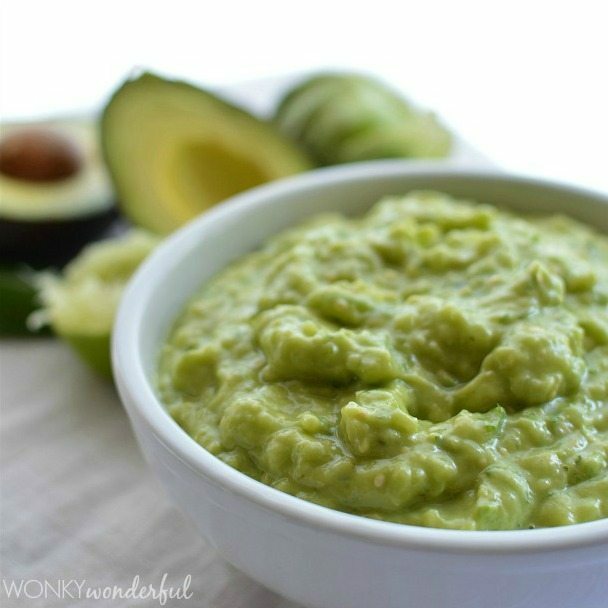 But, I did come up with a way to enjoy this delicious salsa verde without tortilla chips. I will be sharing that recipe on this week’s Healthy Happy Wednesday post. Check out last week’s Healthy Happy Wednesday! It is not necessary to chop the ingredients. Remove the stems and cores of the green tomatoes. Place all ingredients into a food processor and puree to desired consistency. Chop all the ingredients and combine. *I used red onion, but a white onion is fine too. Yields approximately 1¾ Cups Salsa. 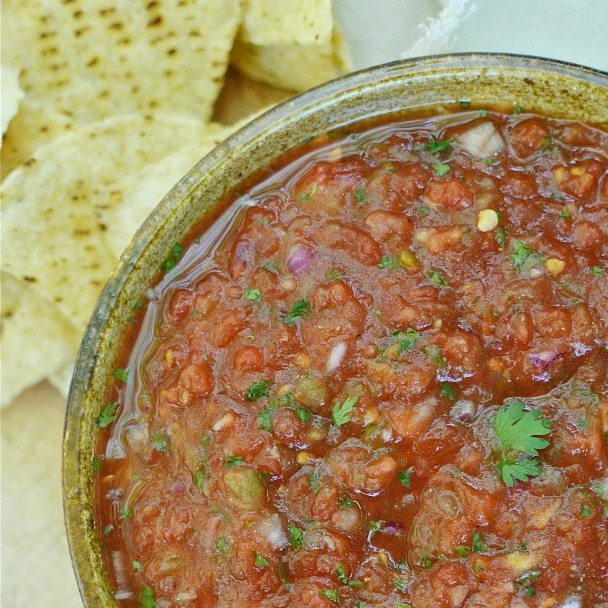 Easy Salsa in less than 10 minutes! I love the idea of substituting green tomatoes for tomatillos! Very clever. Also love the more chunky version as compared to the blended one. Cool stuff! Thanks Chris! I prefer the chunky salsa too! 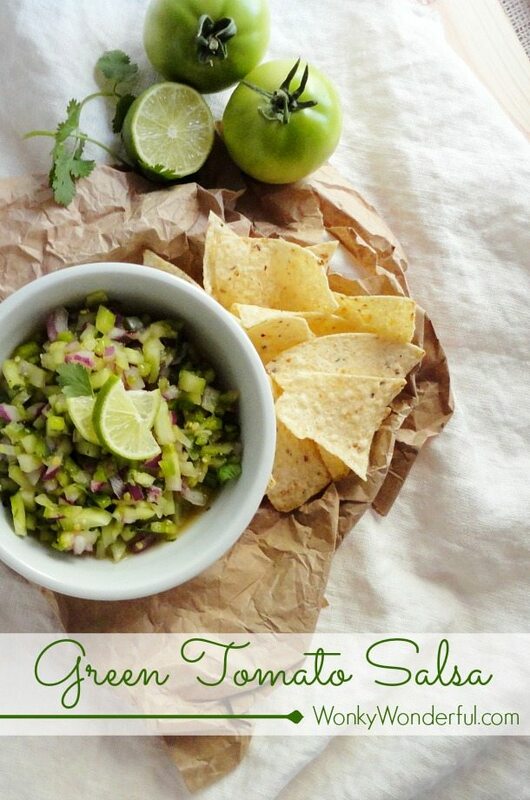 I love green tomatoes and using them in a salsa is such a fabulous idea Nicole! Thanks Tanya! I love green tomatoes too. I’ve been having a lot of fun finding new ways to prepare them instead of my usual fried green tomatoes. We love homemade salsa! I need to get my hands on some green tomatoes! The green tomatoes are a really nice change of pace. Have a great week! My family loves fresh salsa, and we’ve made it with tomatillos or fresh tomatoes – but never green tomatoes.. That’s a wonderful idea. Love your photos here as well – beautiful. Visiting here from Tuesday Talent Show. Thanks Marie! I hope you decide to try salsa with green tomatoes, it’s really tasty! Do you have this same or similar recipe for Canning the salsa? Hi Cindy! The original recipe that I adapted this salsa from involved canning. You can check it out here: Salsa Verde Canning Recipe Have a great week! Looks good. How well does this freeze? I like to make salsa in bulk & freeze the majority of it so we can have homemade salsa through the winter months. This is a stupid question but are green tomatoes just unripened red tomatoes or are they a different variety? Not a stupid question at all. There are so many varieties of tomatoes. Green Tomatoes are large red tomatoes that have not ripened. They have a tart/tangy flavor. You could also use tomatillos, which is what salsa verde is usually made with. Salsa Verde is made with Tomatillos not green tomatoes. Hi Josh! You can peel them if you prefer. I didn’t. Enjoy! I just wanted to let you know that I made this tonight – we were dubious at first that green tomato salsa would be very good, but it was absolutely delicious! I just wish I had more green tomatoes to make more salsa with. Thanks for the recipe! How would frozen green cherry tomatoes work and how? I froze them as is. . . I did not blanche them first. Ideas?? I have never tried it with frozen green tomatoes. I imagine it would work. The consistency would probably be different. Instead of a chunky salsa you will have more of a restaurant style. I jus made your salsa according to this recipe. It is glorious! However, I love spicy so used 2 entire jalapenos and 3 tomatoes. Thank you for this great new salsa! Oh, how I wish my sweetheart loved cilantro. No mind. I get to eat the entire batch myself! This looks like a wonderful salsa, so much so that I featured it as the Recipe of the Day today on a Facebook page I curate called Cooking with Whole Grains & Real, Whole Foods. 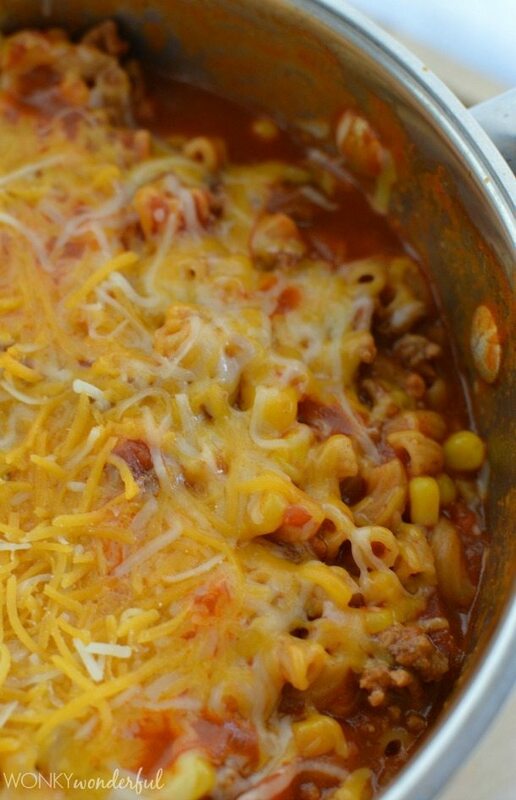 Thank you for a lovely post and a delightful recipe. Thanks Katheryn! I have a cilantro hater in the house too. I love it though! I loved your salsa. However, leftovers two days later didn’t taste like the day I made it. How long does it last? Also, have you ever frozen salsa without loosing the flavor? I’ve made this a couple times since finding your recipe. Our tomato plants have been prolific, but the tomatoes haven’t really been ripening, so this recipe has been a great way to use the green tomatoes. Super yummy! Amazing! I had these green cherry tomatoes hanging around and not ripening. This recipe took me 3 minutes to make and the result is delicious! Awesome! I love this salsa!